99 years leasehold w.e.f 16 August 1999. 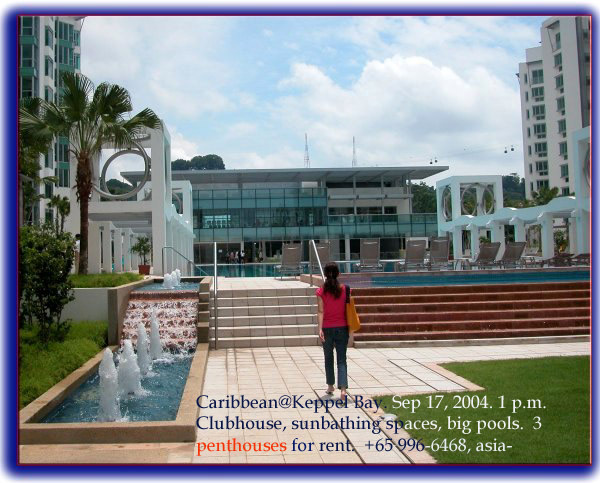 Near Sentosa Island, Sentosa Cove and large shopping mall to be built at World Trade Center area. 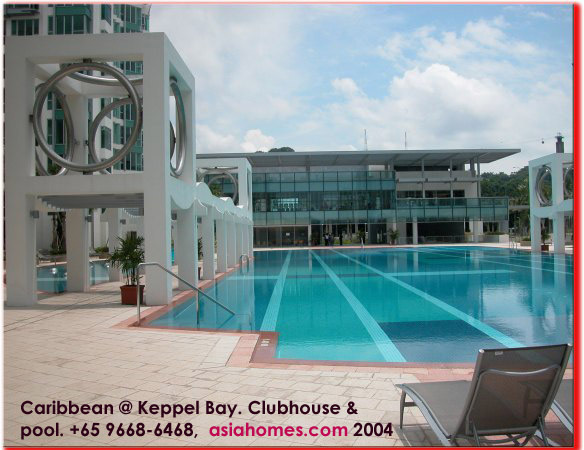 Less than a 3-min drive to city, Orchard Road and university. 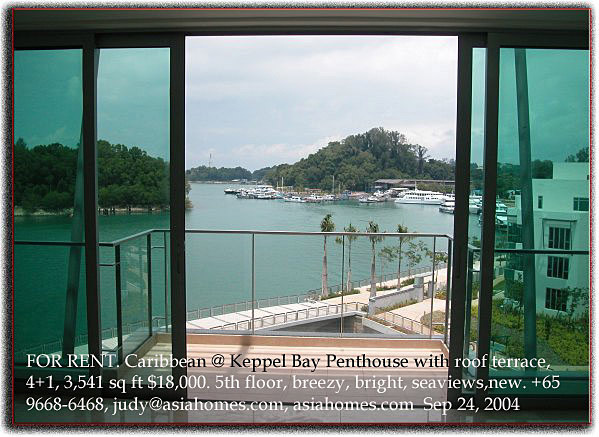 Breezy, waterfront views, bright apartments with balconies. 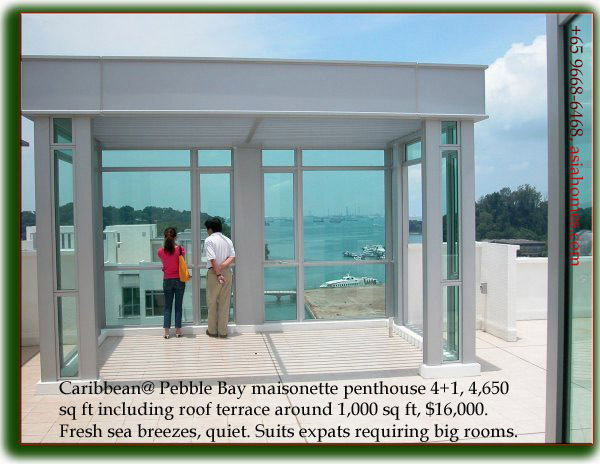 Penthouses have large roof terraces. Private lift to apartment. Broadband cable points. Strict security. Balconies off the living area. Smart features including keyless entry, WebPad to control home systems and access the condominium web portal, remote home automation and broadband network and wired local area network. 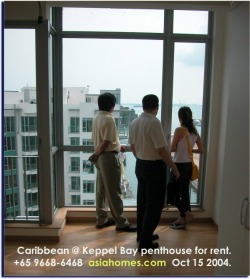 Water fronting condos are 5 levels high, increasing to 10 levels away from the shores. 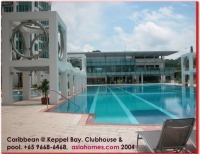 Large clubhouse, pool and fountain pool. 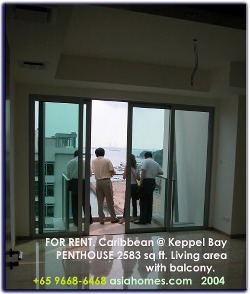 Full condo facilities. 2-bedroom, around $8,000. 3-bedroom rentals are available. 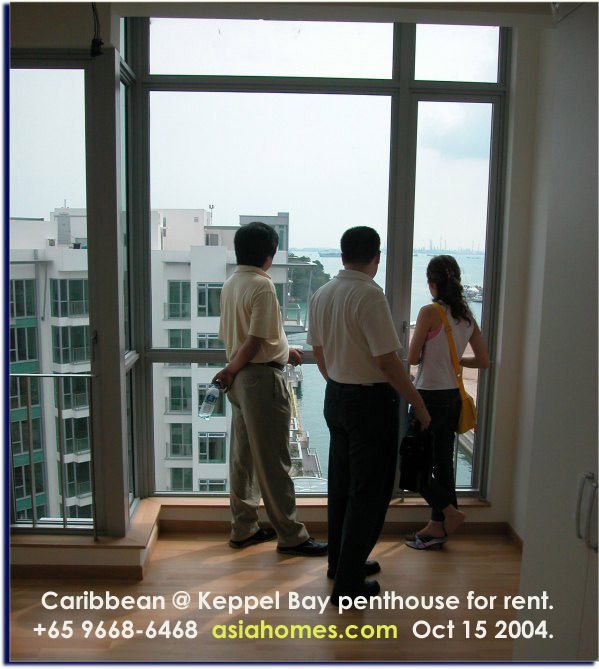 Penthouses up to 6,000 sq ft. Roof terraces around 1,000 sq. ft and are suitable and impressive for corporate entertainment. 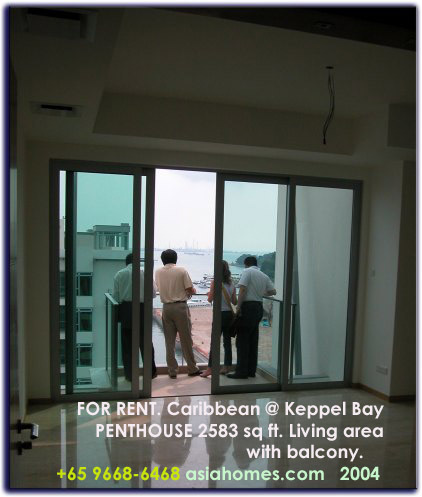 Serviced apartments are available for rentals. with balconies and large roof gardens. Tenanted. Water fronting low-rise. 4 bedroom + maid's room + roof garden upstairs, 3541 sq ft.
4+1 duplex penthouse with large roof garden upstairs, 4650 sq ft.
Large roof terraces with sea views. Can accommodate >200 people for BBQ and birthday party. Suits company CEO or Chairman. 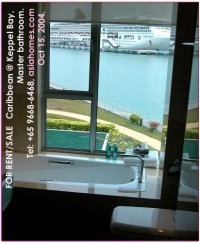 Some master bathrooms have waterfront views of the large cruise ships. 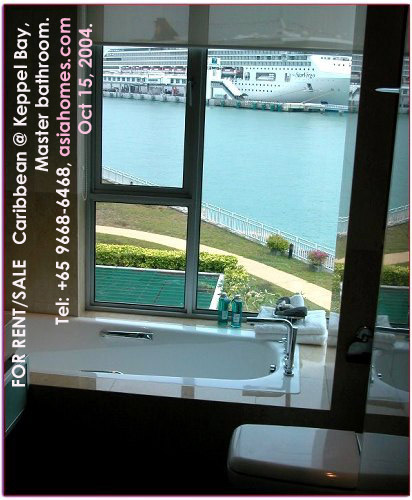 Duplex penthouse of 4650 sq ft has 2 master bathrooms. Suits expat couples without children. 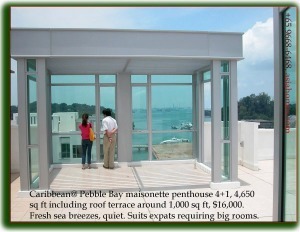 Large roof terrace for company functions or sunbathing. Tenanted. 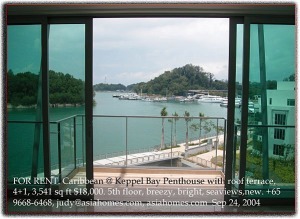 46 Keppel Bay Dr, #10-131. Tenanted. 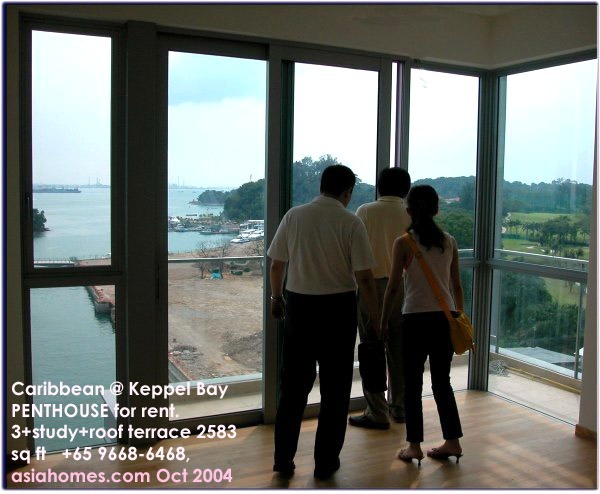 Bedroom Sq ft S$ rent monthly Balconies and large roof terrace. Unblocked sea views. Breezy. Quiet. Brand new. 5th floor, unblocked sea views. 2nd level - large roof terrace. 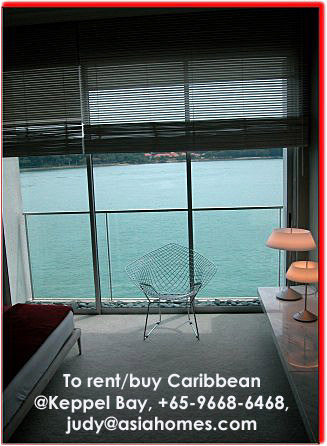 Suits expat couples who want privacy and low rise living close to nature. 9th floor. 2 stories. 3rd level - large roof terrace. Suits expats with >2 children. 10th floor. All 3 bedrooms in a row have unblocked water views. A baby room (study room). 2nd level - large roof terrace. Suits expat couples who are romantic. Pictures are above. 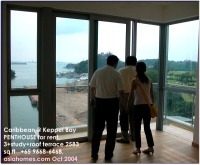 E-mail or fax house-hunting form to us at 6256-0501 and we will contact you within 24- 48 hours. EXPATS TO CONTACT US NOW !